Lake County Schools in Central Florida operates more than 50 schools and serves more than 40,000 students. The district recently completed a multi-year project that included the installation of Extron AV systems in classrooms at several schools such as Sorrento Elementary, Gray Middle School, Lake Minneola High School, Sawgrass Elementary, and Mount Dora Middle School. Classrooms at Eustis Heights Elementary, the latest school to be upgraded, were outfitted with PlenumVault Digital systems from Extron. 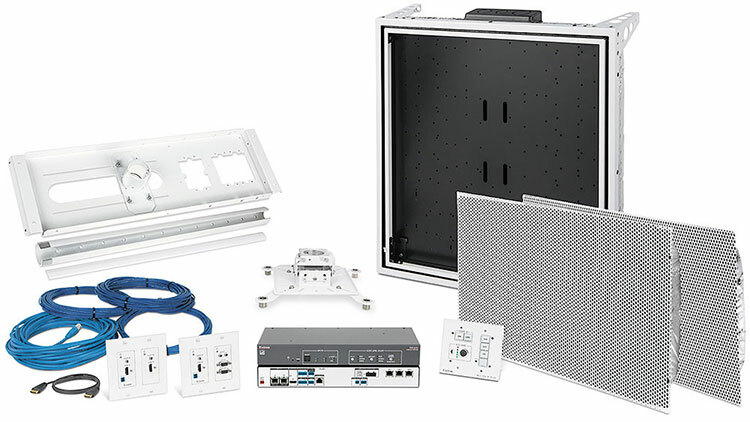 We selected Extron classroom AV systems because of our history with the company, the quality of their products, and the level of support provided at every stage. Before these new systems, the County’s classroom AV was tricky to install and often left the front of the room looking cluttered. “Previously, we installed AV components on the wall next to a short-throw projector,” says Jimmer Roy, Network Security Systems Administrator for Lake County Schools. “This required a significant amount of coordination among trades to get the locations correct for conduit and electrical boxes.” Often, they had to run surface mount raceway for cables, which detracted from the room aesthetics. With PlenumVault Digital Systems, the County is able to seamlessly integrate digital and analog video sources. Their classrooms typically include a networked computer, document camera, and media player. The AV switcher/amplifier and power supply are housed in the PlenumVault mount, with cabling hidden in the ceiling and walls. The PlenumVault mount fits in a standard 2' x 2' suspended ceiling for easy installation. A hinged door simplifies equipment installation, setup, and maintenance. PlenumVault also accepts a trimmed ceiling tile to match the room environment and keep sensitive equipment hidden from view. The new classrooms also feature flat panel displays and with the components hidden away in the ceiling, the front of each room is kept clean and neat. Teachers also appreciate the voice amplification system in each room. The County installed the Extron VoiceLift® Microphone System option with each PlenumVault Digital System to improve speech intelligibility by gently amplifying the teacher’s voice. The pendant microphone is so light weight that teachers are comfortable wearing it for the entire school day. 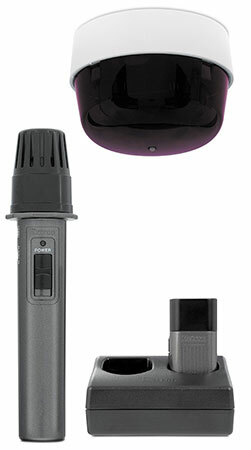 Both teachers and students at Lake County have commented on how useful they find the additional handheld microphone for student participation. “We’ve received a lot of positive feedback from teachers about the VoiceLift Microphone,” says Roy. “Since they don’t have to shout to be heard, they’ve noticed it’s really helped reduce the strain on their voices after a long day of instruction.” Studies show that use of a sound field system, such as the VoiceLift Microphone, results in increased student achievement and a reduction in teacher health issues related to voice fatigue. 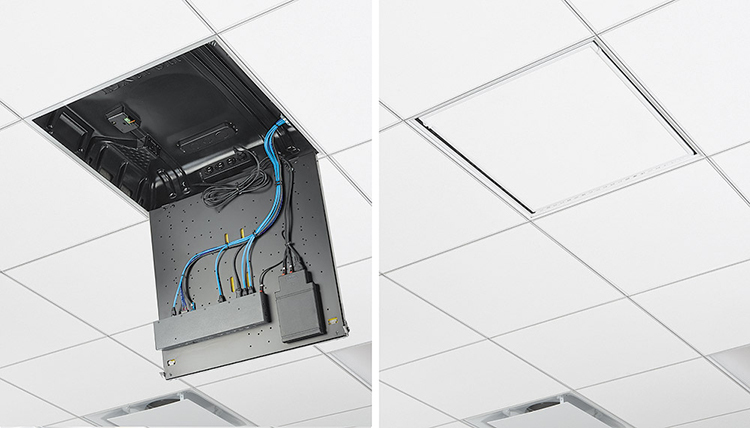 The PlenumVault mount accepts a trimmed ceiling tile to match the room environment and keep sensitive equipment hidden from view.